Our adjustable tubular rear lower control arms for the 1972-1976 Ford Torino and Ranchero outperform the flexible stamped steel control arms with soft rubber bushings that come from the factory. Eliminate wheel hop and increase traction with an easy bolt on installation! The adjustability feature allows for setting the pinion angle. The factory utilized an eccentric bolt that allowed for only 1 degree of pinion angle adjustment. If you replace your worn out factory bushings with new aftermarket rubber or polyurethane bushings they do not offer the eccentric adjustment. Our right hand and left hand threaded control arms allow for easy on-car adjustments, no need to unmount the control arms to make adjustments! Check out all of our performance suspension components for the 1972-1976 Ford Torino and Ranchero by clicking here. New Adjustable Rear Upper Control Arms with Del-Sphere for the 1971-1976 GM B-Body Impala, Caprice, etc. 1971-1976 GM B-Body Impala, Caprice, etc. Our adjustable rear upper control arms for the 1971-1976 GM B-Body Impala, Caprice, etc. outperform the flexible, stamped steel arms and soft rubber bushings that come from the factory. Eliminate wheel hop and increase traction with an easy bolt on installation! All ends are fitted with grease fittings for easy lubrication of the Del-Sphere pivot joints. The adjustability feature allows for setting the pinion angle. Our right hand and left hand threaded silver zinc plated CNC machined 4140 chrome moly double male stud adjuster allows for easy on-car adjustments, no need to unmount the control arm to make adjustments! Available powder coated in your choice of bright red or gloss black for a brilliant and durable finish. Right hand and left hand threaded CNC machined and silver zinc coated 4140 chrome moly double male stud adjuster threads into 4130N chrome moly TIG welded threaded tube adapters. Re-uses OEM mounting hardware, no need to drill out your car’s mounting bracket holes. 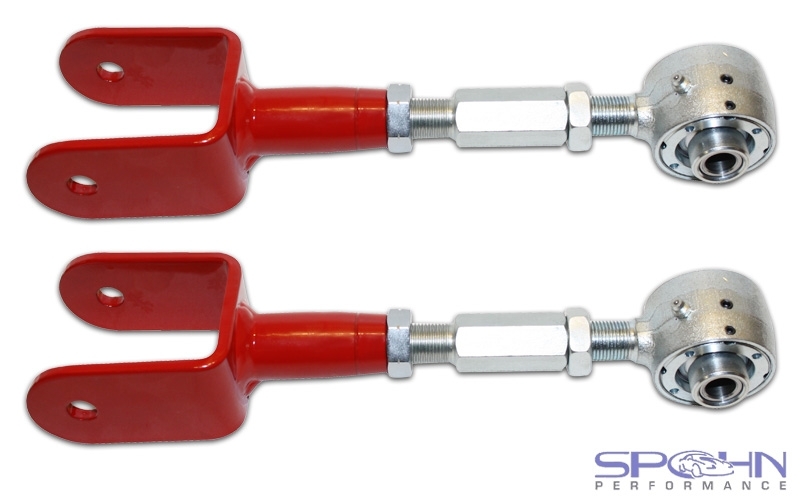 These are the highest quality, easiest to adjust on the car upper control arms on the market! 4130N Upgrade: The ultimate in bullet-proof lightweight strength, 100% TIG welded chrome moly construction! Same as above, but constructed entirely from 4130N chrome moly tubing. Check out all of our performance suspension components for 1971-1976 GM B-Body Impala, Caprice, etc. by clicking here. New Adjustable Rear Upper Control Arms with Poly Bushings for the 1971-1976 GM B-Body Impala, Caprice, etc. Eliminate wheel hop and increase traction with an easy bolt on installation! All ends are fitted with grease fittings for easy lubrication of the fluted polyurethane bushings. Polyurethane bushed (fluted) ends equipped with grease fittings for easy lubrication. New Tubular Rear Upper Control Arms with Poly Bushings for the 1971-1976 GM B-Body Impala, Caprice, etc. Our tubular rear upper control arms for the 1971-1976 GM B-Body Impala, Caprice, etc. outperform the flexible, stamped steel arms and soft rubber bushings that come from the factory. 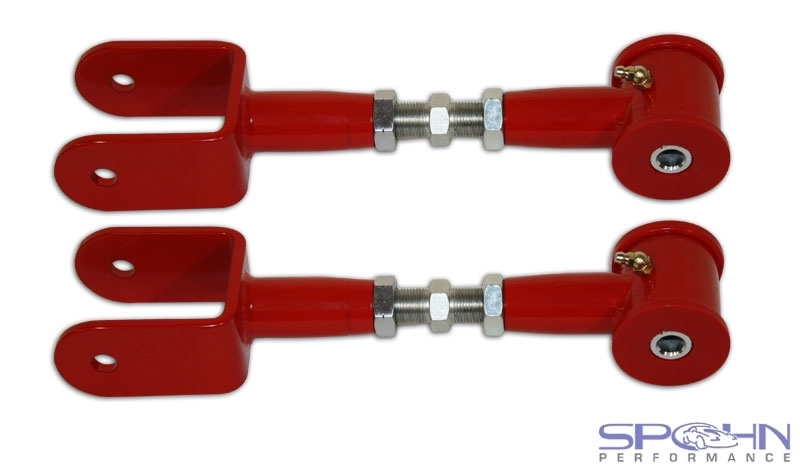 New Boxed Rear Lower Control Arms with Poly Bushings for the 1971-1976 GM B-Body Impala, Caprice, etc. 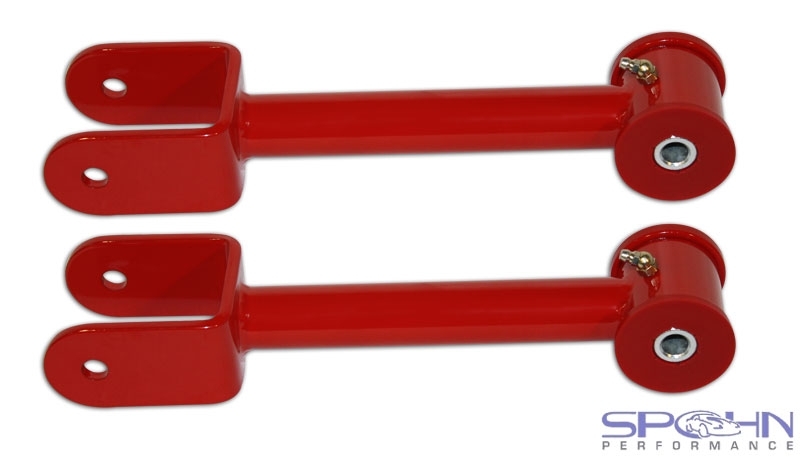 Our boxed rear lower control arms for the 1971-1976 GM B-Body Impala, Caprice, etc. outperform the flexible, stamped-steel arms and soft rubber bushings that come from the factory. Our boxed LCAs are constructed from CNC laser cut 2.00″ x 1.50″ x .120″ wall rectangular tubing and are 100% TIG welded for the ultimate in strength, durability and appearance. These rear lower control arms feature 0.875″ o.d. x .188″ wall sway bar mounting bolt through sleeves TIG welded in place to handle the most severe abuse and provide for easy direct bolt on of a rear sway bar.